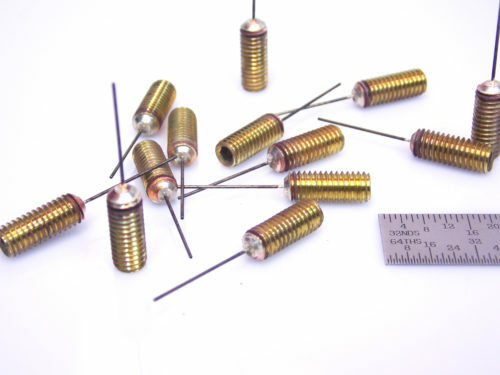 Projects - Ziggy's Tubes and Wires, Inc.
Our team at Ziggy’s excels at manufacturing custom components containing small hypodermic tubing and wires. Below are some examples of some of the different projects our team has worked on. 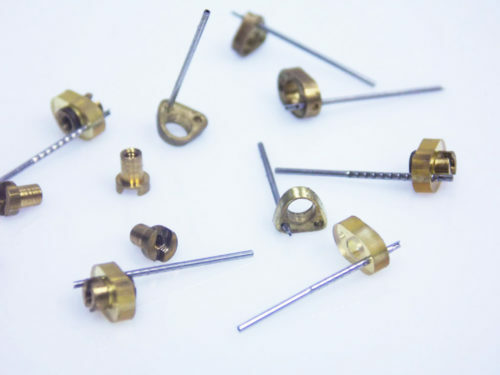 These parts are made by drilling through the brass set screw, inserting a cut-to-length s/s tube, and assembling the two with thermal induction welding. They are used in hydrostatic systems. I am an academic research scientist leading my own lab in Brooklyn, NY. I started working with late Mr. Stampfl back in the early 2000’s, when he was still at Small Parts and I was a postdoctoral fellow. My work involves neurophysiological recording in behaving rats. I need to lower individually moving electrodes in the brains of the animals and to do so, I mount all these electrodes and the drive assembly that effects the movement in a structure which then gets anchored to the skull of the animal. Mr. Stampfl helped me with modifying the drives, which require high precision machining: the diameter of the nut of such an assembly, approximately 2 mm wide and about the same tall, carries a piece of stainless steel tubing cut at dimension, deburred, and notched at one end. Mr. Stampfl’s work was impeccable and his suggestions for modifying the drive assembly led to significant improvements in the performance of this part. I continued to work with Mr Stampfl after he left Small Parts to start his own company, Ziggy’s Tubes and Wires. I was his fateful customer across all the years until he sadly passed away. His work is now carried on by Bruce and the next generation in the company, and the standards have remained equally high. I recommend Ziggy’s Tubes and Wires to all my colleagues in the field who need similar type of work, and I vouch for the work ethics and support you will get here.